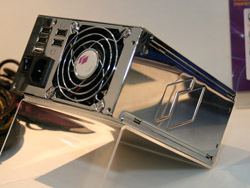 Hiper is a well known PSU manufacturer. Their booth at CeBIT has a few surprises. 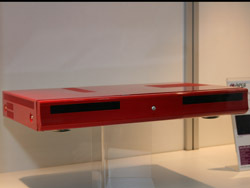 They have the HPU-5B770 on display in different colors. The above pictures show the shiny silver and the glossy black variants, but they are also available in blue. 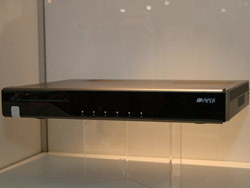 As the name suggests, it delivers 770W and it features a four port USB 2.0 hub in the back. There is a fifth USB 2.0 connector which delivers 1.0A even if the computer is turned off. This is perfect for charging your MP3 player or cell phone. 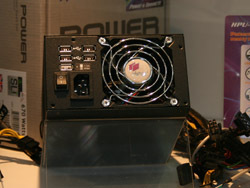 Right next to that you will find the other 5th generation Hiper PSU. This one is called HPU-5M830 and delivers 830W. It has 8 USB 2.0 connectors as well as a USB 2.0 charger, just like the HPU-5B770W. 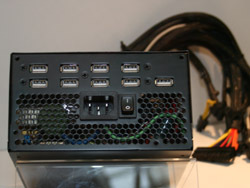 Both these power supplies feature 8 and 6 pin PCIe connectors for the latest graphic cards. The company also sells keyboards. The above two only differ in color. They carry the model names HCK-1K12A for the gun metal black and HCK-1S12A for the silver variant. 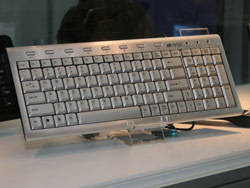 These are slim keyboards and use USB 2.0. 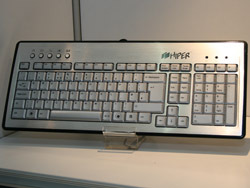 Hiper also showed a compact keyboard with a different layout to eliminate space needed for cursor keys and the above buttons. This variant is available in black and silver and the body is constructed of aluminum. 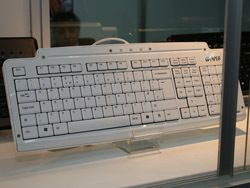 Another keyboard was on display, which was painted in white. The paint job is immaculate and even though it may look like it is intended for Apple computers, the Windows buttons tell a different story. 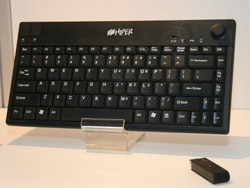 Hiper also offers a wireless keyboard which features a joystick on the top right corner for mouse movement and two large buttons on the left top corner to use as mouse buttons. This keyboard is quite compact and should be great for home theater systems. 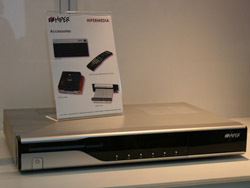 Hiper also sells really slim HTPC enclosures which look like DVD players, but can house entire computers. These utilize mATX or ITX based mainboards and come in three flavors. The HMC-2K53A-H2 comes with an MSI K9NGM2 AM2 based mainboard, while the HMC-2K53A-C0 and HMC-2K53A-D0 do not have a mainboard included. The latter two differentiate in the CPUs they are intended for (AMD or Intel based). 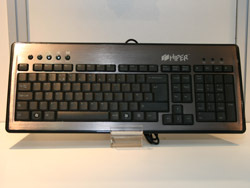 The required extras, like low profile CPU cooler, riser card and wireless keyboard are sold separately by Hiper. 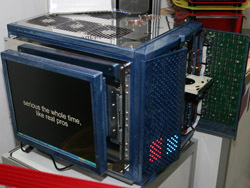 As with many other manufacturers, Hiper is displaying a modded PC at their booth. Besides that, they also have two actual Penthouse models at the booth to present the Hiper products.